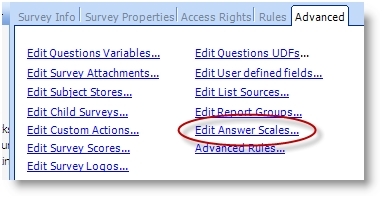 A very useful feature of SurveyToGo is answer scales. 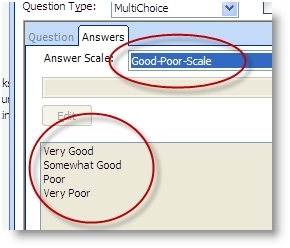 A Scale is a set of pre-defined answers that you can then re-use throughout your survey without the need to add the same answers list again and again. Dramatically reduce the maintenance effort and risk of such lists when the questionnaire and list is updated. Note: When the script is created the first step is building the skeleton (adding chapters and sub chapters, adding the questions and the answers). At this stage you will add the answers of each question. Try to review first the questionnaire to identify repeating answer lists and create the scales. If you have any doubt if that is a repeating answer list then simply create it as a scale. note you can set other properties other then the text as well through this screen. ** You can click the “Create Name” button to have SurveyToGo generate a name for your scale automatically. Once selected you can go and edit the scale name as it will be taken by default from the question's text. Is there a way to dynamically change created answer scales with the script? There is no option to do that dynamically from within a script. Can you explain why is the showing/hiding more complex for you than building dynamically the scale would? 2) When data goes to our processing team, it is not convenient for them to have other codes than the ones in the separate lists. I understand. A solution to what you describe can be to create for example 2 distinct questions, each with it's relevant scale and show/hide the relevant one during an interview dynamically using entrance rules. Then call it from wherever you need it in your script for example ShowScaleAnswers(QRef(10), 1, 20); to show Answers 1 to 20 in question index 10.